Maslow’s Hierarchy of Needs is a theory of psychological development developed by Abraham Maslow in a 1943 paper entitled “A Theory of Human Motivation.” Over the span of his career as a psychologist, Maslow expanded on his original idea to include his observations of natural curiosity. In order to discover what motivated human behavior, Maslow studied people who be believe to be exemplary people including as Albert Einstein and Eleanor Roosevelt. Additionally, he studied the healthiest segments of the general population, such as the top 1% of the college students in one study. According to Maslow, if these basic needs were not met, the individual may feel anxious. He suggested that the most basic level of needs must be satisfied before a person will be motivated to seek higher level needs. Maslow coined the term “metamotivation” to describe the motivation of people experience when they strive for self improvement. As Maslow continued to study human developmental psychology, he expanded hierarchy of need. The five stage model was extended to include cognitive and aesthetic needs as well as transcendence needs. The changes to the original five-stage model included a seven-stage model and a eight-stage model shown below. Safety needs – protection from elements, security, order, law, stability, etc. Cognitive needs – knowledge and understanding, curiosity, exploration, need for meaning and predictability. Aesthetic needs – appreciation and search for beauty, balance, form, etc. Transcendence needs – helping others to achieve self actualization. Self-actualization is a term that has is used in a number of psychology theories. It typically is the phenomena of realizing one’s full potential. The search for spiritual enlightenment, pursuit of knowledge, and the desire to be of service are examples of self-actualization. 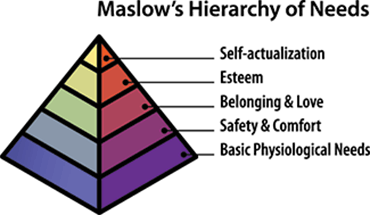 Maslow has received credit for popularizing the term with his hierarchy of needs theory. He believed that to become self-actualized, the person must not only achieve the previous needs, but master them. Later in life, Maslow explored the idea of self-transcendence as a necessary step towards self-actualization. He believed that an individual only achieves self-actualization by giving of oneself to some higher goal in altruism and spirituality. In other words, self-actualization is the result of being of service to others. It’s important for anyone recovering from a mental health problem such as anxiety, depression or addiction to first focus on the basic needs for shelter, food, and water. This even holds true for relationship problems. When basic needs are met, the person can then focus on the process of healing. Maslow, A. H. (1954). Motivation and personality. New York, NY: Harper and Row. Maslow, A. H. (1968). Toward a Psychology of Being. New York, NY: D. Van Nostrand Company. Maslow, A. H. (1970). Religions, values, and peak experiences. New York, NY: Penguin. Mittelman, W. (1991). Maslow’s study of self-actualization: A reinterpretation. Journal of Humanistic Psychology. 31 (1): 114–135. Tay, L. and Diener, E. (2011). Needs and subjective well-being around the world. Journal of Personality and Social Psychology. 101 (2): 354–365.